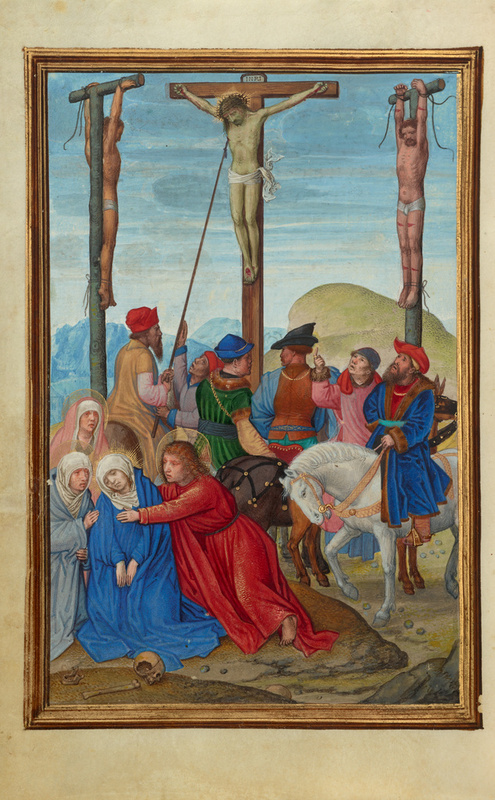 While a crowd gathers in the lower half of the miniature, the bodies of Christ and the two thieves remain silhouetted against a light blue sky in the upper half of the illumination. By isolating the body of Christ against this blue background, Simon Bening emphasized the long lance piercing his side; a text devoted to the lancing directly follows this illumination. At the bottom left, the Virgin swoons with grief, supported by Saint John and two women. John's hand touches the area of Mary's side that corresponds to the lance wound in Christ's side, drawing attention to the pain she shares with her son.